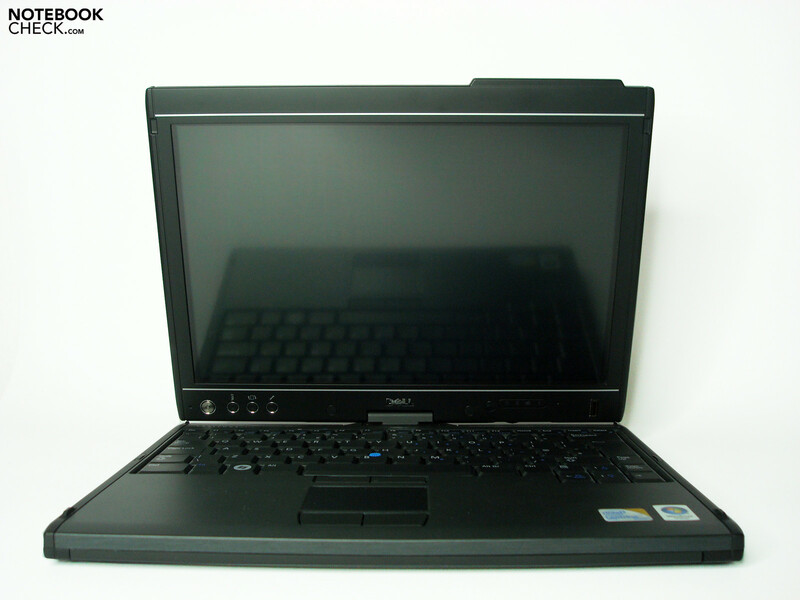 The Dell Latitude XT2 is a classic work horse and bids a variety of additional operation possibilities with its convertible construction. Equipped with exclusive energy saving components, a multi-touch capable display and numerous interfaces, it will have to show its true potential in the following review. The alignment of our prototype at hand is a bit unusual. For one thing, Samsung's older 64 GB SSD, which Dell already has replaced with 128 GB sized starter model, is still in use. For another, our prototype has been equipped with an English keyboard, which is completely different to the usual German layout. 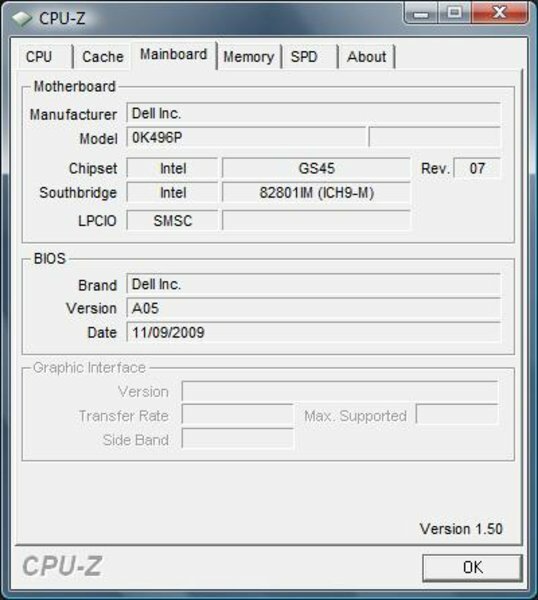 We find Windows Vista Business 32 bit as the operating system, but Windows 7 in various alternatives is already orderable. 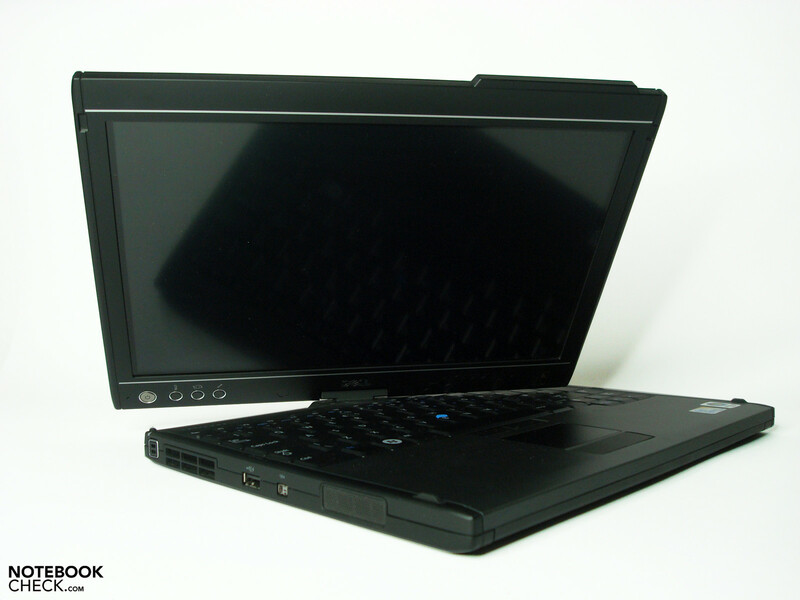 Otherwise, the tested Latitude XT2 has Intel's Core 2 Duo SU9400 processor with a 1.4 GHz clock rate, 2 GB DDR3 RAM and a large scope of interfaces. An integrated webcam isn't available. 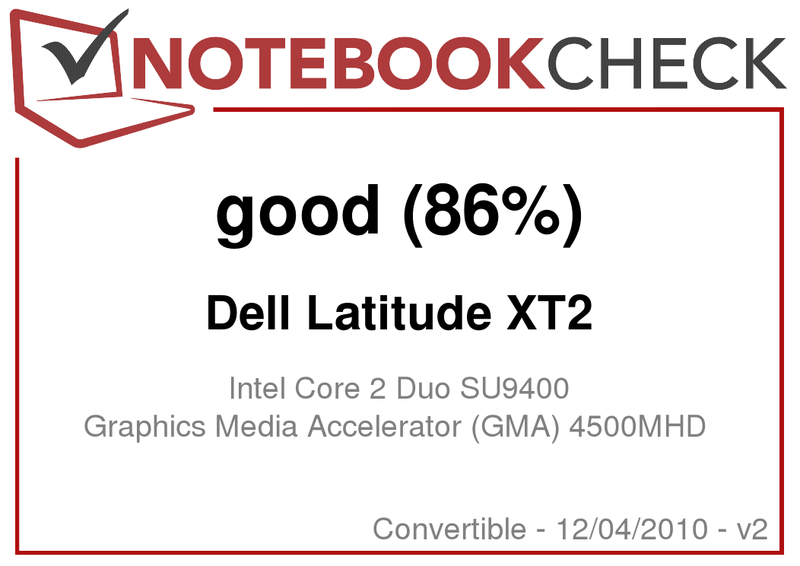 The Dell Latitude XT2 justifies its destiny entirely and presents itself in a business gray that is only hard to beat in terms of understatement. The fine structured display back radiates a bit of esprit, as it reminds of brushed aluminum or black ebony. The same structure is found in the wrist rest area, which also loosens up the interior work surface discreetly. The used materials make a very high-end and sturdy impression. The base unit distinguishes itself with an exemplary firmness and can't be depressed palpably anywhere. The wrist rest is adamant and has enough place for even longer typing tasks. The manufacturing quality is overall of high quality and no irregular gaps or production flaws can be seen. The battery that also has an optical battery level indicator, sits tight and the component covers on the bottom can be accessed quickly as they are fastened with few screws. The display lid proves to be not quite as impressive. 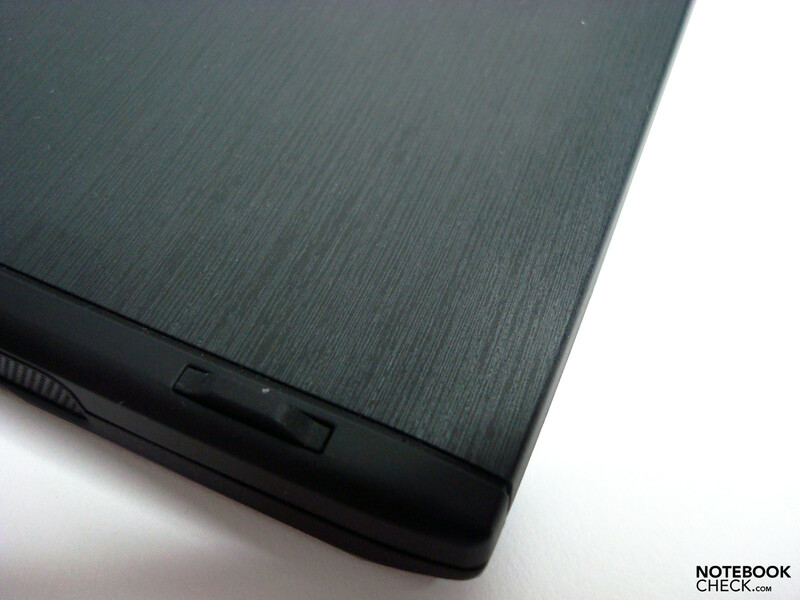 The display hinge already doesn't make quite a stable impression and is quickly instable. It can't prevent a teetering on moving ground for long. At first sight, you could blame the central rotating hinge construction, which has to manage several tasks at the same time. Pivot joint, hinge and display lock. But if you look closer, you see that there is a bit too much tolerance between the single elements and thus, the actual possible stability isn't achieved. 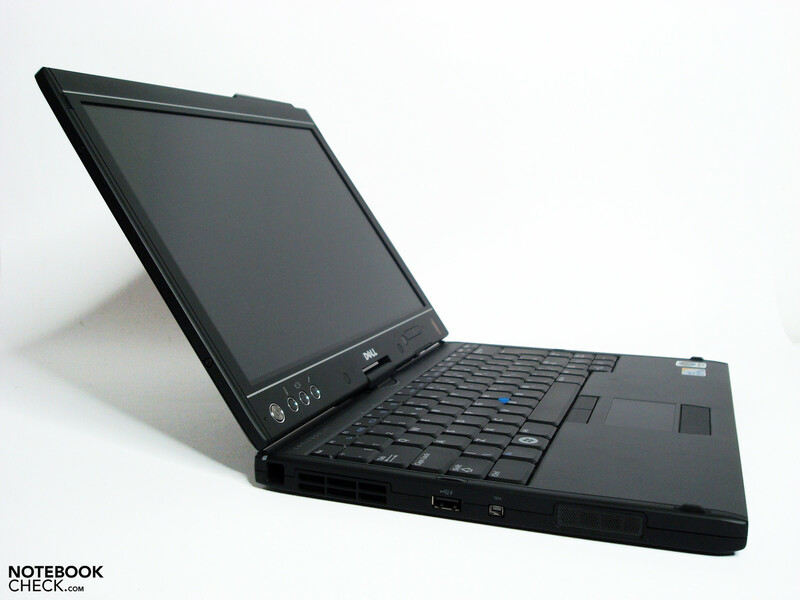 In direct comparison, a HP2710p at hand relies on a similar construction and is more convincing in this point. The display lid lets itself be twisted with a bit of pressure and counter-pressure and doesn't quite correlate to the quality expected in this price category. As this hasn't so much weight in normal notebooks, it can, especially in tablet mode, already be restricting. With pressure on the right display edge (in tablet mode it would be the lower edge), you can easily conjure up image disturbances (waves). To what extent this will be a restriction is, of course, an individual decision; in any case, it's a small flaw in the quality impression section. The basic data, then again, convince with compact proportions of 297(w) x 222.6(d) x 27.4(h) mm and a low total weight of 1620 grams. The weight increases to about 1720 grams with the stronger 6 cell battery and with a battery slice or docking station also the size, particularly the height. 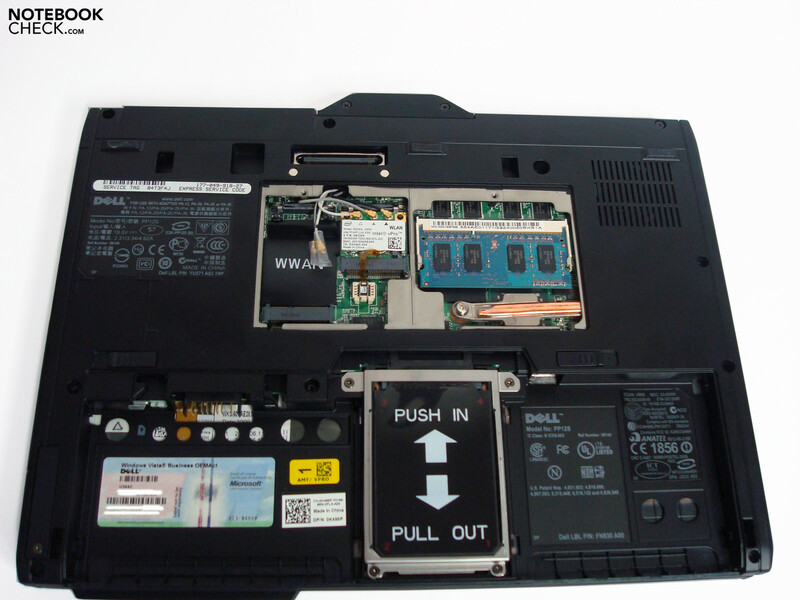 The Dell Latitude XT2 doesn't have a webcam and at the moment, you can't order it with one, at least not online, either. This will peeve users of Skype & co. a bit, as they have to fall back on an external solution. In return, this needs additional space in the notebook case. 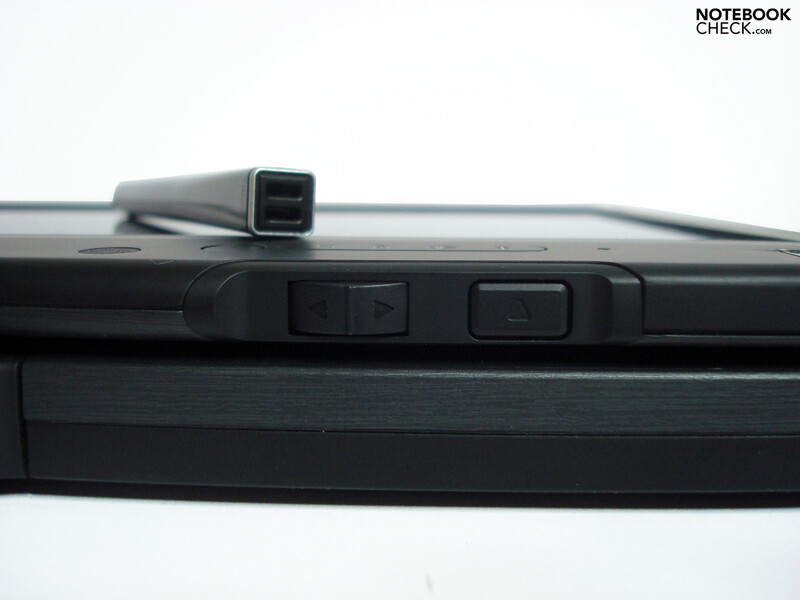 For this, the Latitude XT2 has an abundance of interfaces, which will make user hearts leap. 3x USB 2.0, Firewire (IEEE1394), eSATA (USB/eSATA combo port), cardreader, ExpressCard/54, fingerprint reader, Trusted Platform Module 1.2, LAN, VGA, audio in/out and Kensington lock preparation. The connections have been practically placed on the left, right, and rear and thus, aren't in each other's way. The connections performance quality is also impressive. Assessed transfer rates: USB 2.0 - 27.8 MB/s, FW - 38.3 MB/s, eSATA - 88.4 MB/s and SD card - 17.1 MB/s. Whilst Firewire will especially please camcorder fans, the eSATA port is predestined for using faster external hard disks. 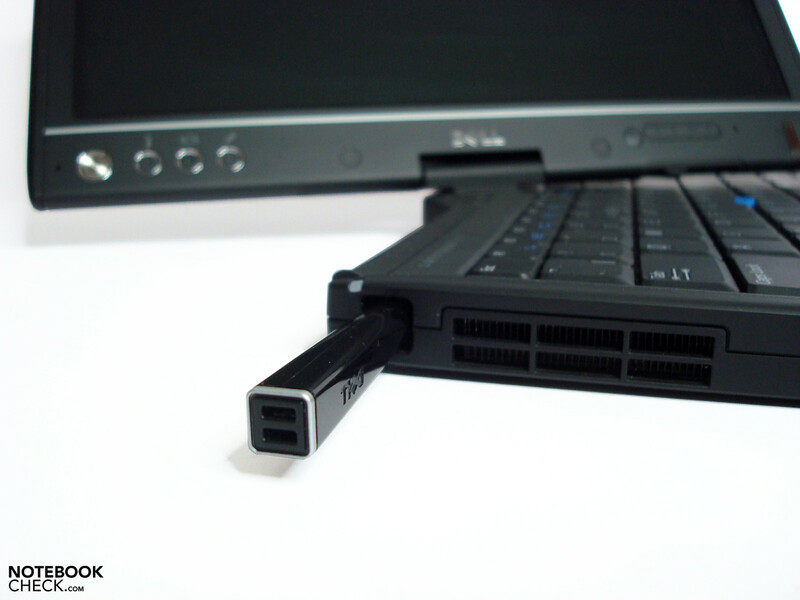 The USB connections cover, as usual, larger areas of possible peripherals but they also bid two features in Dell's Latitude XT2. On the one hand, it has a so-called USB Power Share Port on the left that allows for recharging external devices, such as MP3 players, cell phones and much more, when the notebook is deactivated. 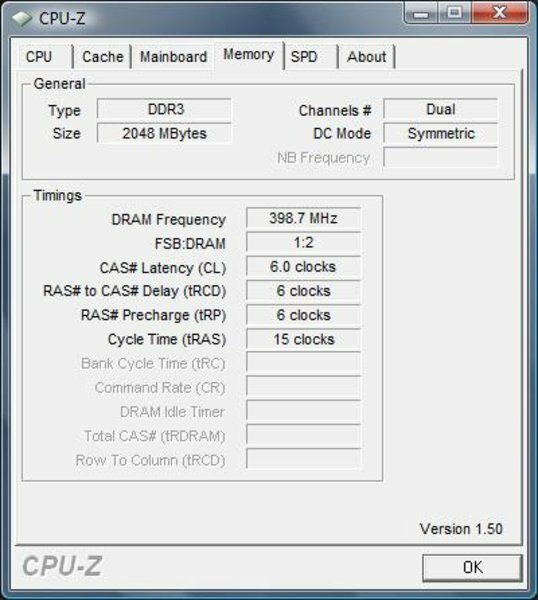 You can set up to which state of charge of the battery this function can be used in the BIOS. This feature was disabled in our prototype and had to be turned on before initial charging. 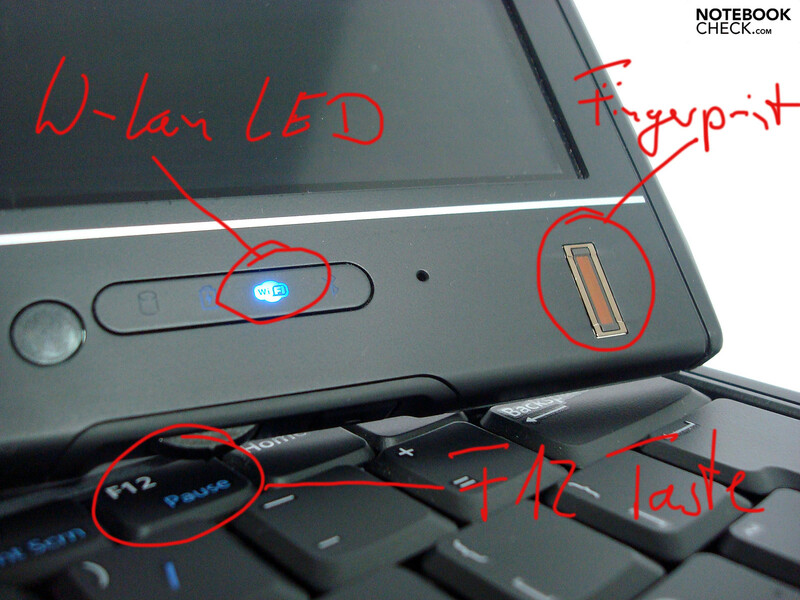 A further USB feature is found on the rear with the "Powered USB". 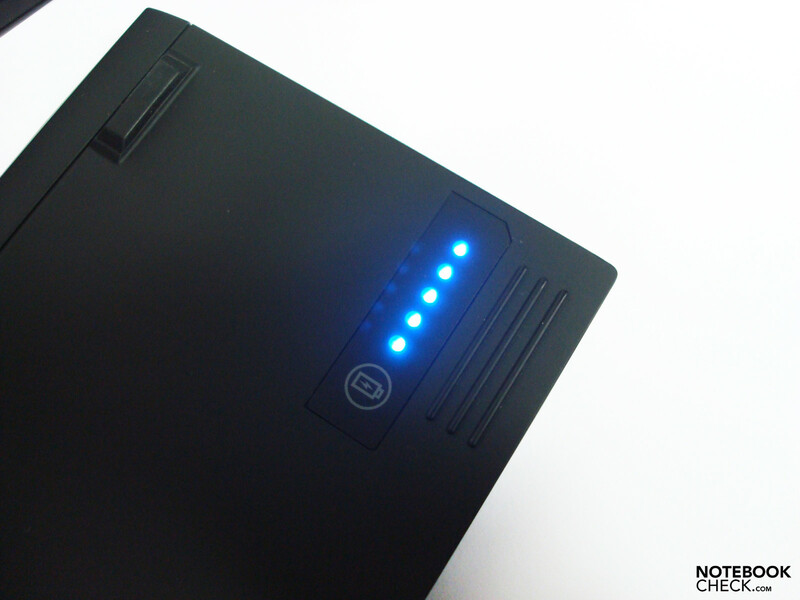 An additional 5 pin power supply is found above the usual USB port, which is supposed to provide especially hungry external devices as a 2nd energy source. External devices that use such an interface are still unknown to us. An inquiry at Dell hasn't been answered until the editorial deadline, but will be added as soon as available. 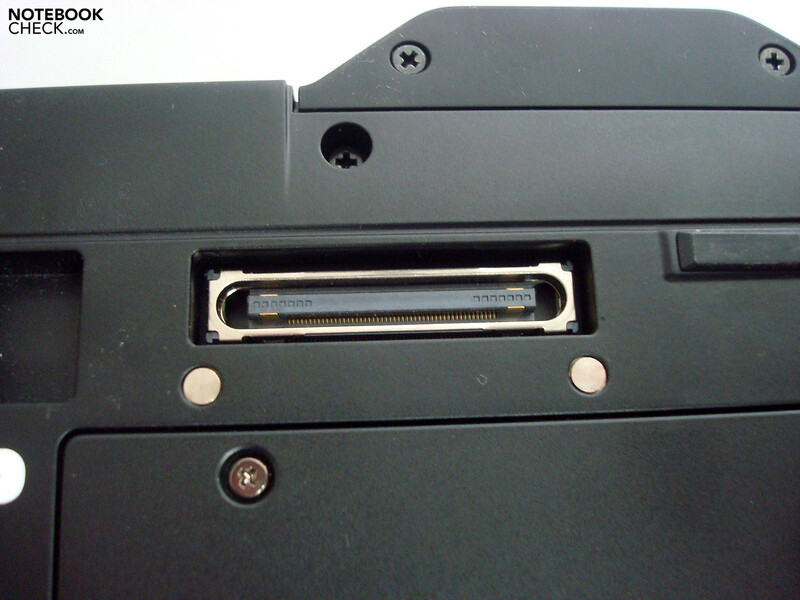 The ExpressCard/54 extension slot can accommodate both ExpressCard/54 and ExpressCard/34 extensions. Thus, TV cards, video cards, UMTS modems or further supplementary interfaces can be retrofitted. 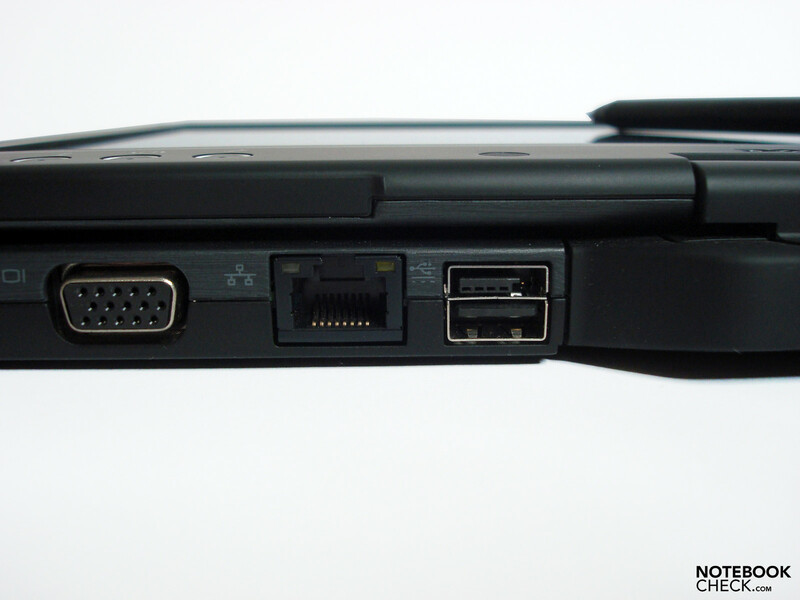 An additional extension option is the integrated docking port on the subtray. 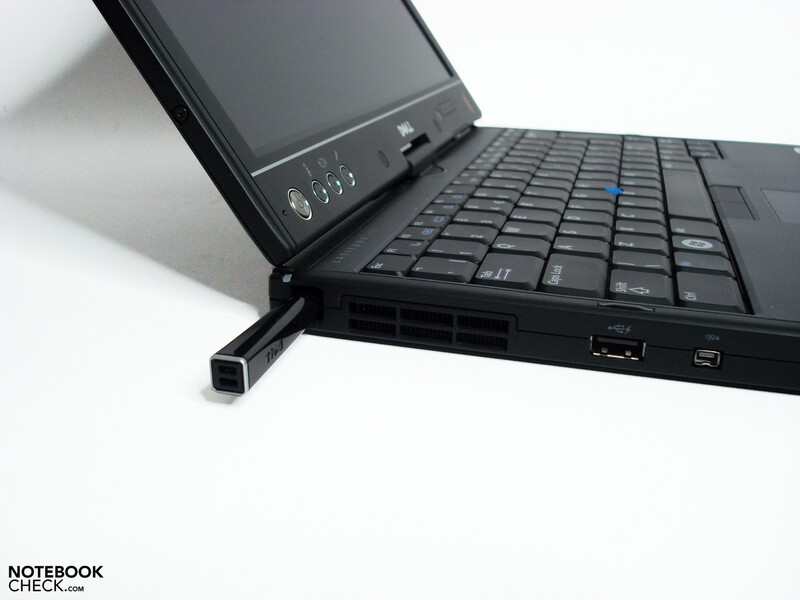 A connected docking station (Dell Docking PR12s) provides additional interfaces and spares the user from tedious plugging and unplugging on-site peripherals for stationary use. We couldn't find any products in relation to this on Dell's site in our test period, but certainly something can be managed, as usual, via telephone. The analog VGA-out supplies a good, clear signal at a resolution of 1280 x 1024 and thus bids a good precondition for calling on external monitors. Our prototype bids WLAN in n-standard as a wireless connection option. 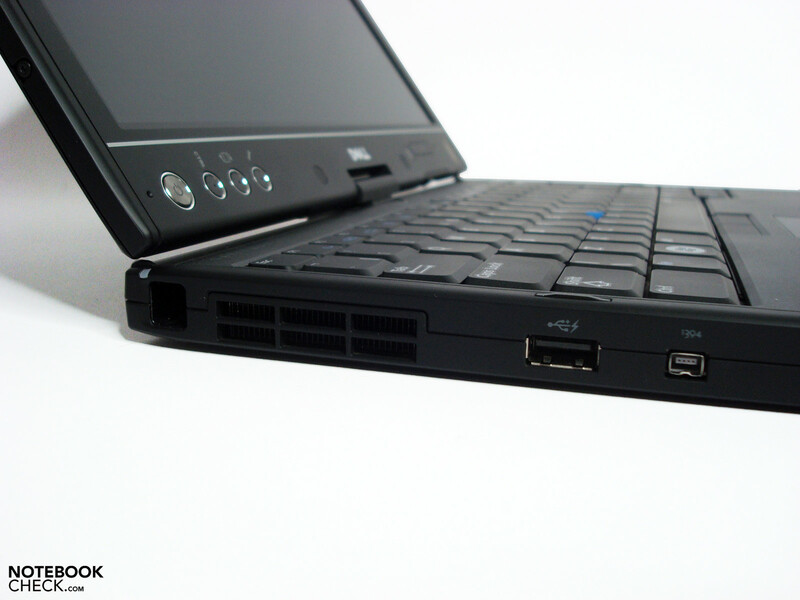 Bluetooth and UMTs are optionally available and can be selected in Dell's online shop. 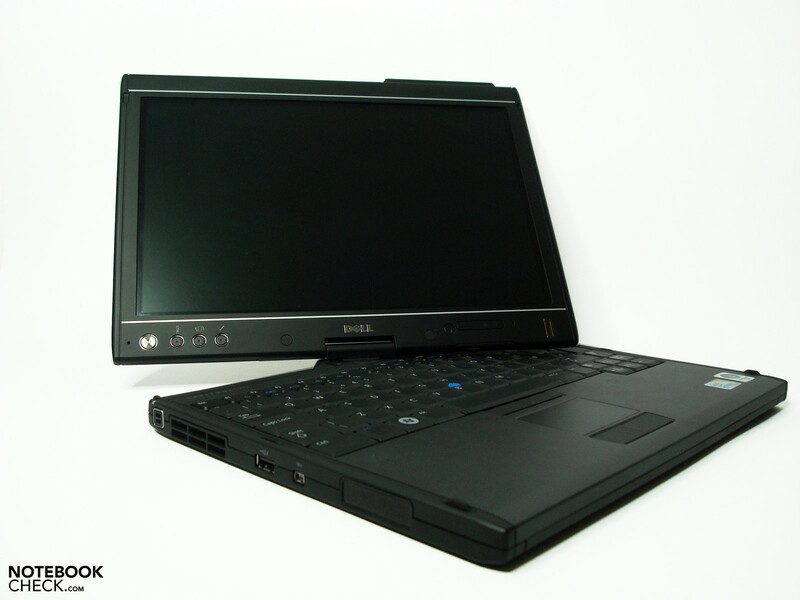 You can also find a variety of Dell-specific and third party supplies there, as well as in the supply shop. Input devices, docking stations, port replicators, supplementary batteries, external drives (E-family modular external media bay for optical drives or hard disks) and of course, a lot of support and warranty options. The keyboard strikes with a short stroke length and a comparatively comfortable key size. The subjective typing feel is very good. 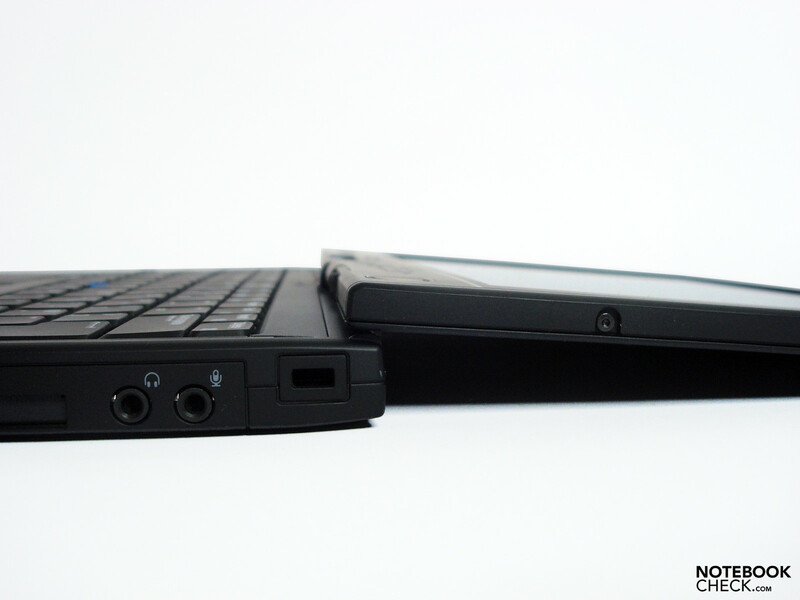 Our prototype is equipped with the English keyboard layout and requires according accommodation abilities. The beauty is, naturally, also available with the usual QWERTZ keyboard in a German layout. A keyboard light isn't available. 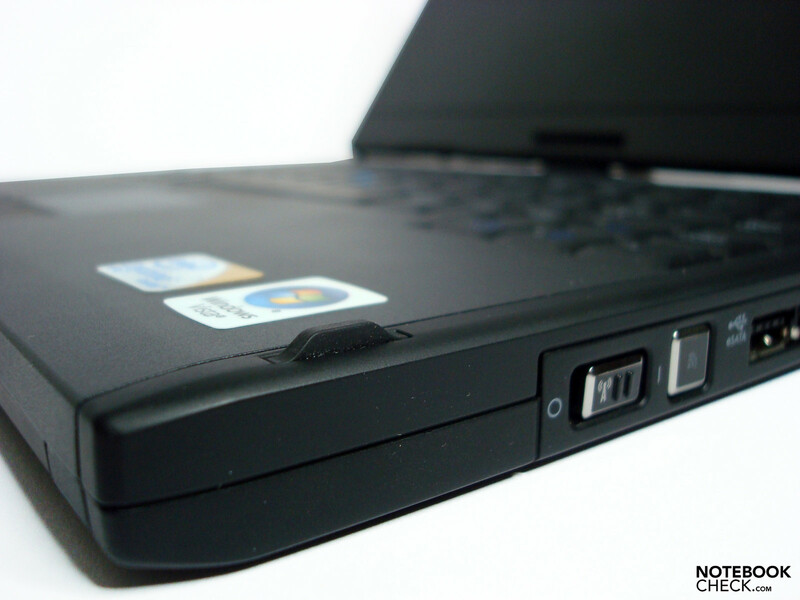 The keyboard basically sits tight and can only be deflected slightly in some places. The stroke noise is pleasant, but can't hide a quiet clattering of the bigger keys, though. In relation to this, the lettering could be a bit richer in contrast, as they are hard to see in dim light. The somewhat too small touchpad is well feasible for basic tasks, as it has good gliding traits and a pleasant response sensitivity. 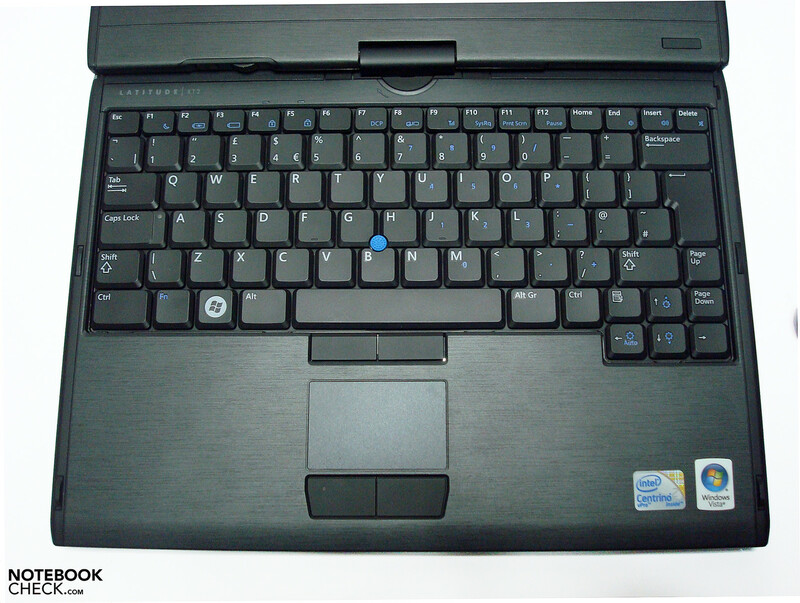 The touchpad keys are smooth, also react well and have a sufficient base area. 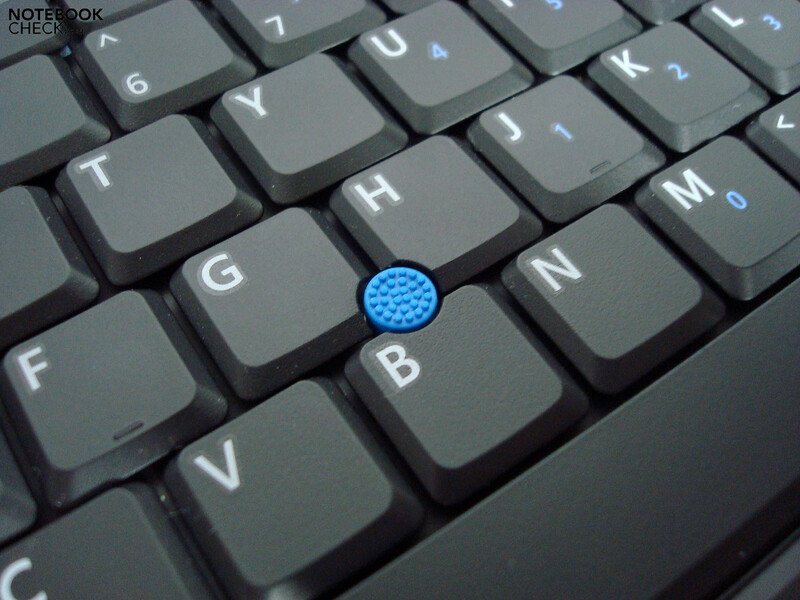 For our taste, the trackpoint has been submerged a bit too deep, isn't very comfortable and thus can lead to unintentional triggering of the surrounding keys. The correlating trackpoint keys are somewhat stiff and also only accept "clicks" on the bottom half. 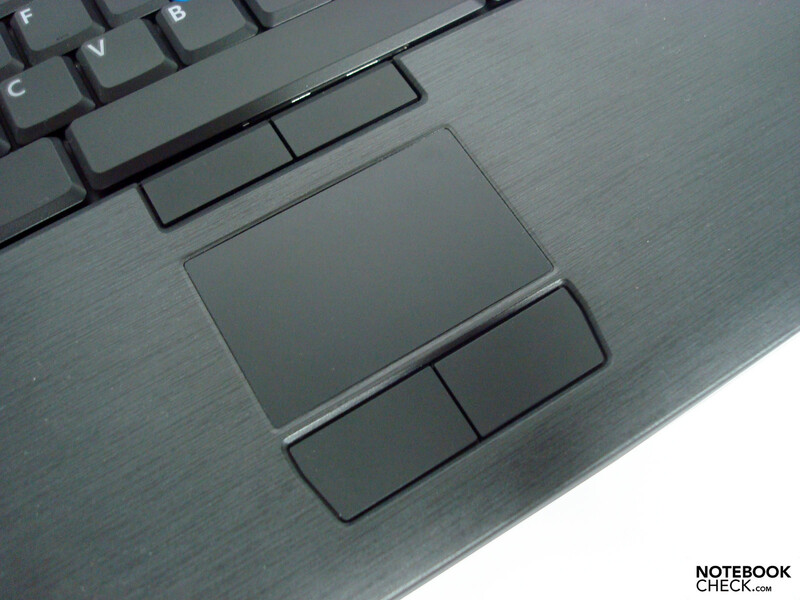 The lower positioning also has a negative effect on the accessibility in comparison to the wrist rest and space key. Otherwise, the cursor can be moved quite adequately over the desktop, but scarcely invites to a permanent use due to the mentioned disadvantage. 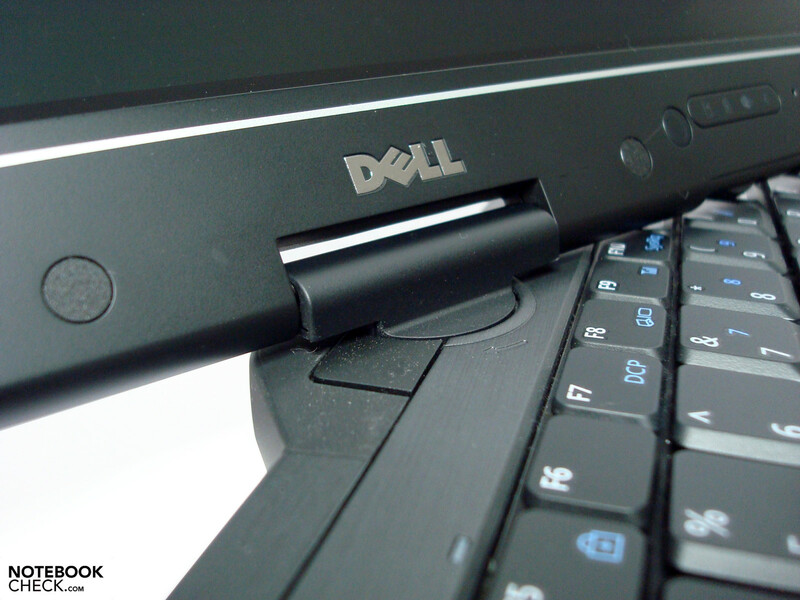 Dell offers two well-functioning options for an input via the display right away. For opening files quickly, clicking on desktop links, etc. you intuitively use the well-working finger input. 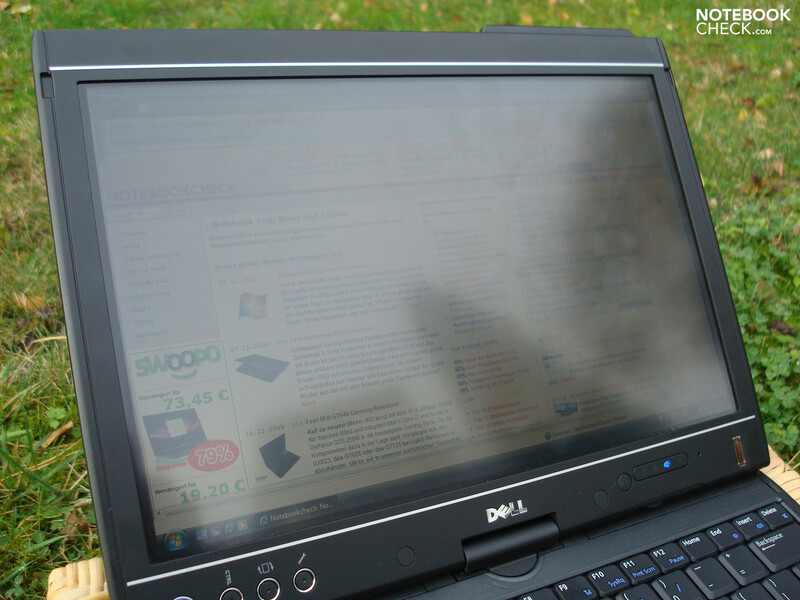 The screen that has a capacitive surface from the manufacturer N-Trig already responds at the slightest touch. 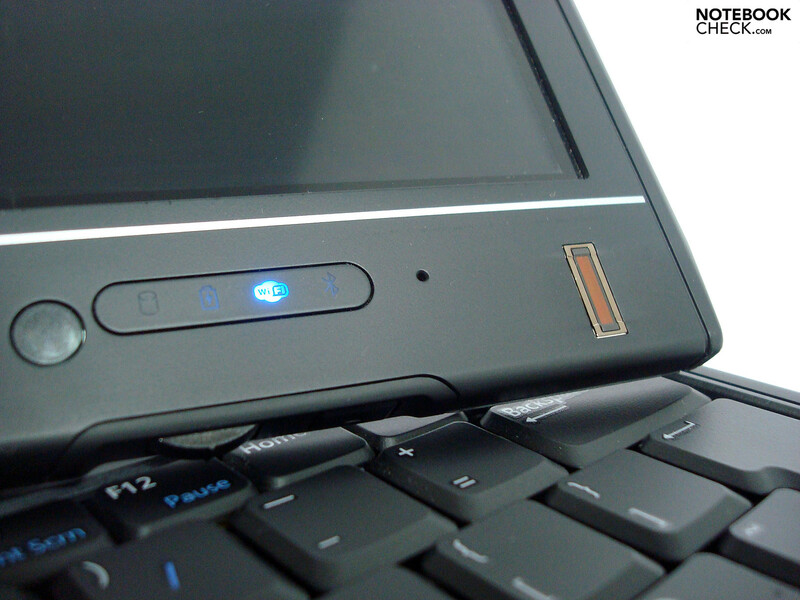 A small, virtual mouse appears on the display, of which the right and left mouse key can be used as usual. There is also a little training animation that helps you a bit at first use. The screen didn't respond to multi-touch gestures, such as magnifying, minimizing, etc. 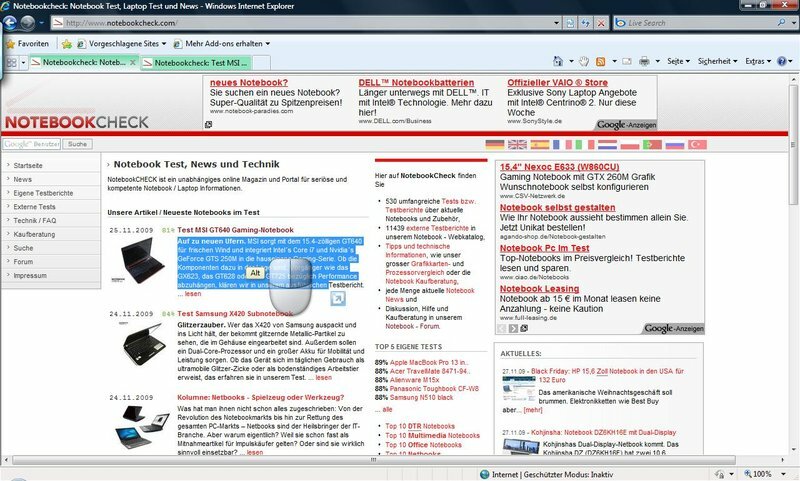 under Vista Business 32 bit. Maybe this works with an installed Windows 7 that has an improved multi-touch support. This couldn't be tried out in the current prototype, though. The very precise working, batteryless pen, which calibrates accurate responses in every area of the display, provides more exact inputs. In comparison: We had to accept deviations of up to 2 mm between pen tip and displayed position in the outer screen areas in the HP 2710p. We didn't even establish 1 mm in the Dell XT2. However, the system always peeved during calibration with the message that the wrong pen was being used. We tried several functions with Microsoft Word and Adobe Photoshop and can state that it is a practical extension after some time of accommodation. Thus, separating objects in image editing or quickly written note amendments directly on image material are conceivable operating fields to which you quickly get used to. Even creating a fast freehanded sketch to complement a presentation works well. 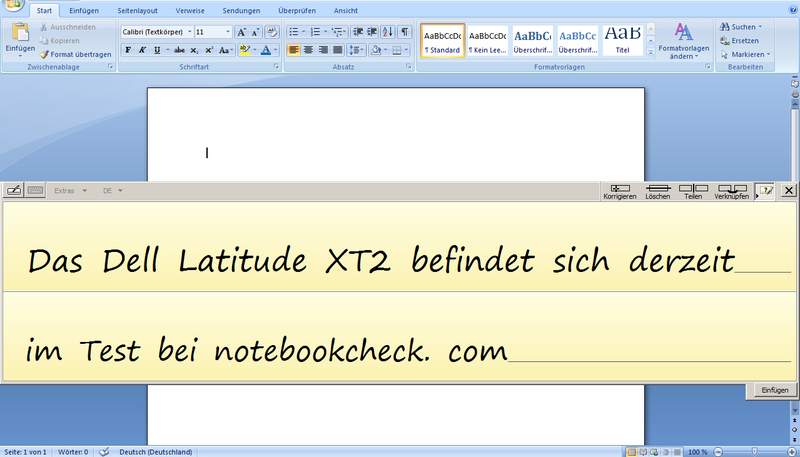 Word and Open Office (tested on HP's 2710p under Windows 7) additionally offer the option of implementing entered handwritten texts into Word / Office documents, which can be very handy especially in tablet mode without an available keyboard. The intense tracing during pen input seemed a bit strange to us, as we didn't notice this in the HP 2710p, for example. They can be removed quite easily from the surface, like fingerprints, but doubts turn up about the durability. 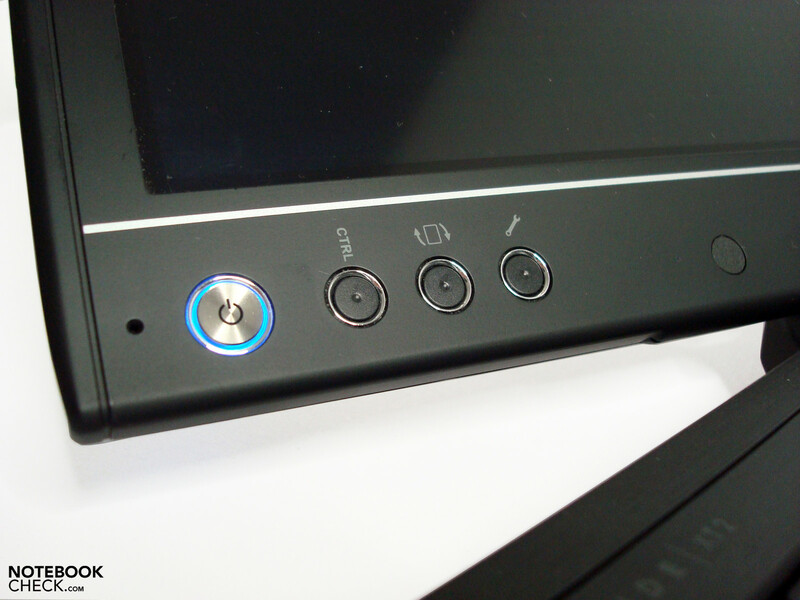 Finger input is disabled when the input pen approaches the screen surface in order to prevent erroneous inputs. It doesn't always work as reliably as it would have been desired but you can deal with it after a bit of accommodation time. So, palms & co. don't lead to any discomforts or mistakes. Aside from that, you can also dispose of hot keys on the display edge, which complement pen inputs. The scroll wheel placed on the display's lateral edge is also practical for scrolling, as it simplifies the managing of documents. The desktop aligns itself automatically when the display is swiveled. So, it changes from wide screen mode to tablet mode (vertical format) and vice versa. 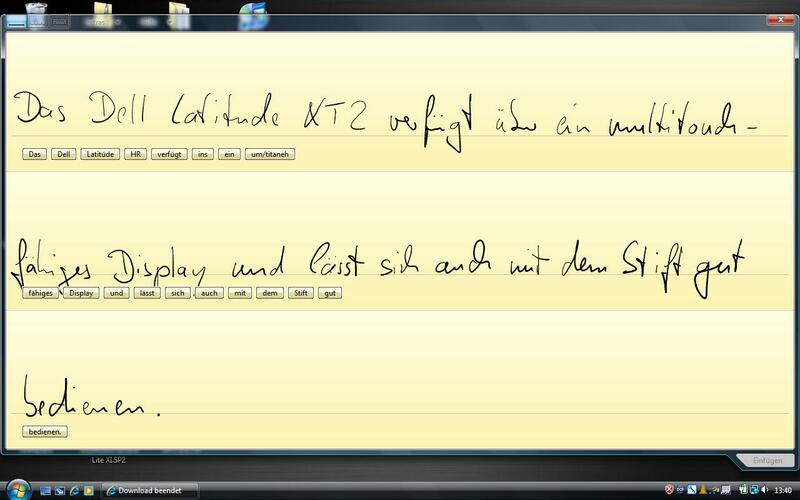 The handwriting recognition is capable of learning. 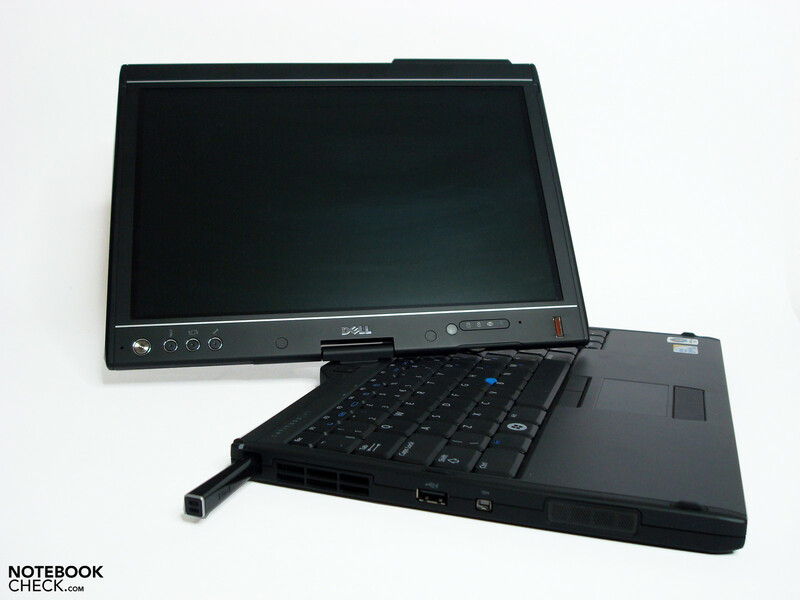 Dell currently offers two different configurations for the Latitude XT2. 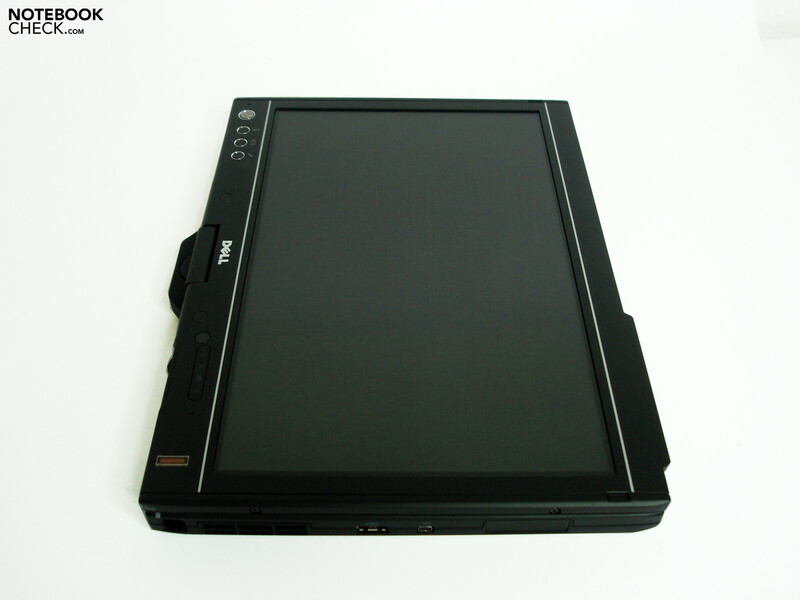 These have a capacitive surface from the manufacturer N-Trig and accept both finger, as well as pen inputs (digitizer). 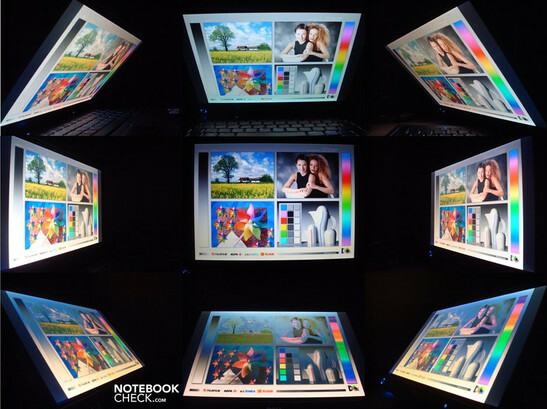 The so-called daylight view display alternative is supposed to be especially made for outdoor use and thus offers a good perceptibility at larger viewing angles even in bright surrounding light. The common LED alternative, as we also have in our prototype, isn't as luminous as the outdoor alternative but allegedly also makes wide viewing angles possible. A 12.1" screen from AU Optronics serves the basis, which has been refined by a sensitive surface, as already mentioned. The resolution, alike the aspect ratio is identical in both alternatives and is 1280 x 800 pixels to 16:10. The dot density is around 125 dpi and shouldn't cause eye problems for most users. The scarcely found "old" wide screen format in current releases has the advantage of offering a few extra image lines on the vertical work plane and thus reduces the scrolling frequency during text document editing. In return, you have to cope with wider black bars when watching latest video material in a 16:9 format. This effect is intensified when the convertible's feature is used. Then you have the option of changing the display alignment in a vertical format (800x1280) in table mode. This way, especially text documents can be edited page by page in a practical direction, almost without having to scroll. The measured brightness rates ranged from a minimum of 162.6 cd/m2 in the right central area to a maximum of 194.4 cd/m2 in the upper center area. We only assessed an average brightness of 177.6 cd/m2 together with the other seven measuring points, in any case. The illumination of 84% is still within a good range and only slight cloud formations (on uni-colored backgrounds) could be seen on the display. The generally matt display has a fairly smooth surface and is only reflective in a deactivated state or silhouettes of the surroundings are mirrored at adverse light incidence. This effect can be reduced to a minimum with maximum background light and allows working without annoying reflections. They only first turn up again when the screen LEDs don't have enough power to outshine reflective objects in especially bright surrounding light situations. These disturbances aren't by far as intensive as in the known glossy displays but for outdoor use, you should take the intended Daylight View display, anyway. Generally, an outdoor use in shadowy places or under cloudy skies should be possible, but is very restricted due to the average brightness of 177.6 cd/m2. The perceptibility of content is at least positively supported by a good contrast ration and the good viewing angle stability. This doesn't help much, in particular on sunny summer days and/or direct sunlight and you don't have much choice but to look for a shadowy place. We found, as already mentioned, the assessed high contrast of 535:1 very positive. Black is much blacker on this screen than those we've seen in many of the reviewed notebooks in the last months. The other colors also appear saturated and vivid on the display and images and videos look a lot more real. 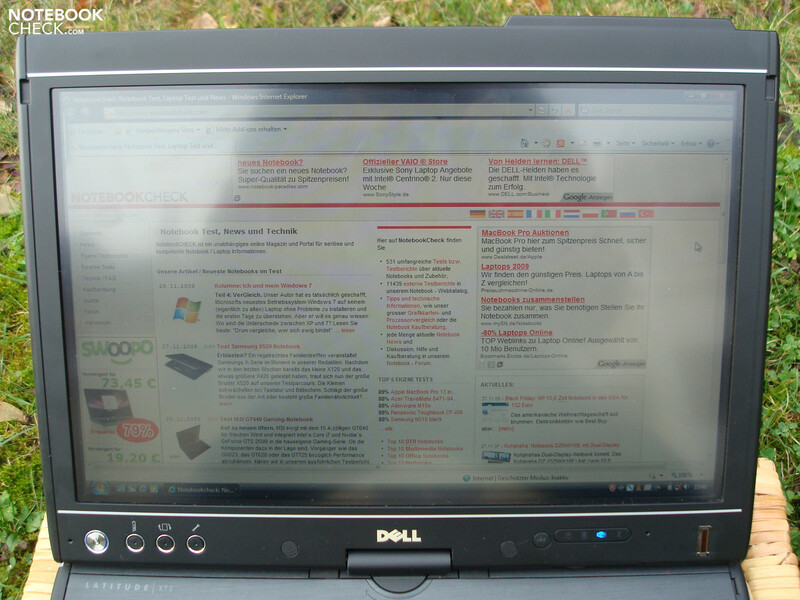 The viewing angles are over-average in comparison to the usual notebook competitors and content can still be well recognized even from obtuse angles. As usual, the horizontal fields score much better results than the vertical planes. Here, you have to accept slight color and saturation deviations. White discolors to bluish from upper viewing angles and to reddish from lower viewing angles, which then finally leads to color inversions in further course. In any case, image editors will suffer more than users of the usual office software. Expensive energy savings components that should still have a sufficient efficiency are used in Dell's XT2. 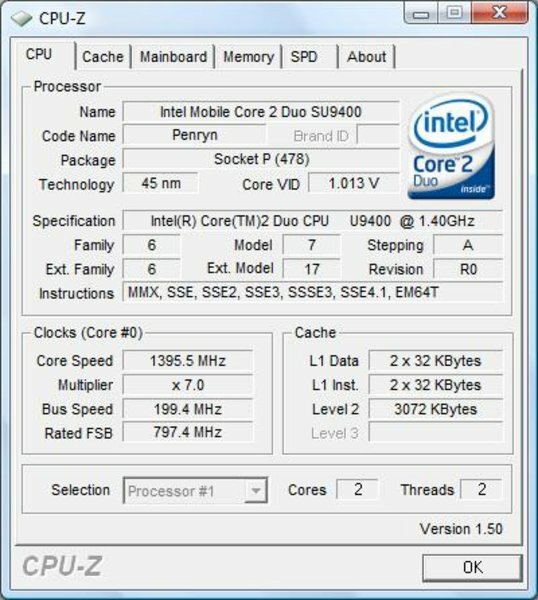 The Montevina chip set, Intel GS45, with an integrated Intel GMA 4500MHD graphic chip set and Intel's Core 2 Duo SU9400 ULV processor with a 1.4 GHz clock rate and a 3 MB sized L2 cache builds the basis. 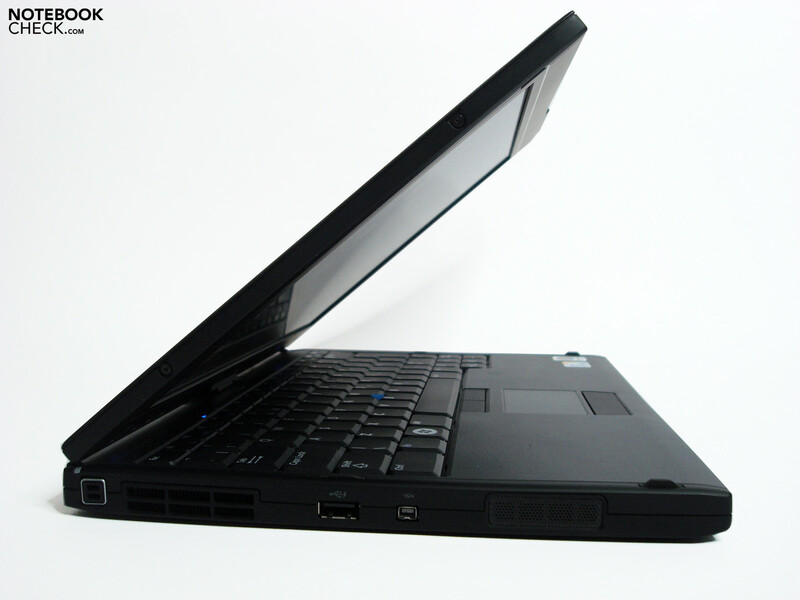 The Latitude is equipped with a 2GB DDR3 RAM, whereas 1GB has been welded to the board. Thus, the actual possible memory extension of 8 GB is restricted to 5 GB. The benchmark results clearly show for which tasks the XT2 has been built for. 3D applications, like CAD, 3D animations or games, can barely be executed. 615 points in Cinebench OpenGL Shading or the 3D Mark results, such as 513 points in 3DMark '06, speak for themselves. 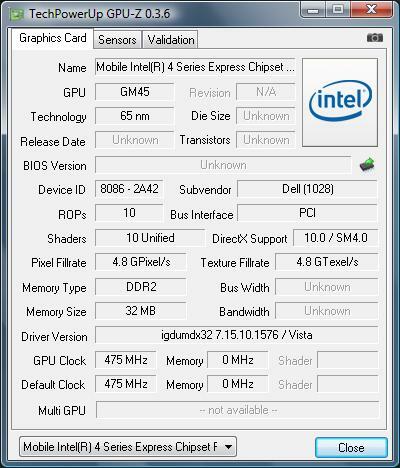 A dedicated graphic card is needed for applications with these main fields, but which currently isn't available for the Latitude XT2. In opposition, the application performance is within a good field, with 4635 points in PCMark '05 and 3124 points in PCMark Vantage and all office tasks can be managed quickly. Creating presentations, managing data banks, editing text documents and spread sheet computing can be just as well executed as image editing and creating drawings (pen input). FullHD videos with H.264 format are rendered smoothly with a max. 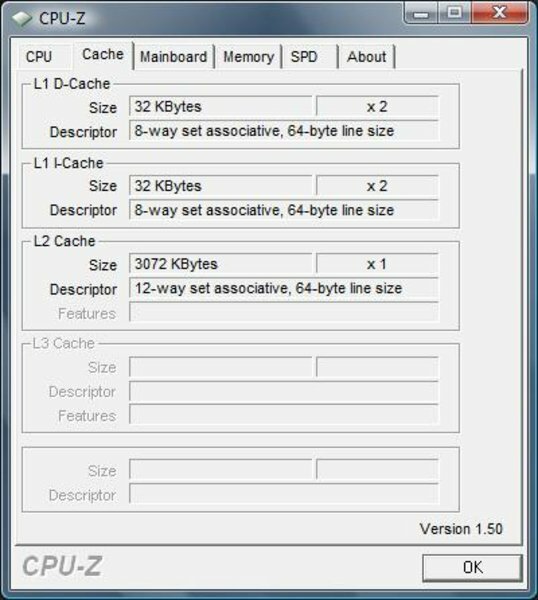 of 26% CPU capacity in Media Player Classic. Cyberlink's PowerDVD or Neros Showtime should provide similar results, as we've already seen in other tests. The XT2 converts MP3 files into a AAC format with a 15.2-fold velocity and thus, supplies a practical result without requiring a too long waiting time. 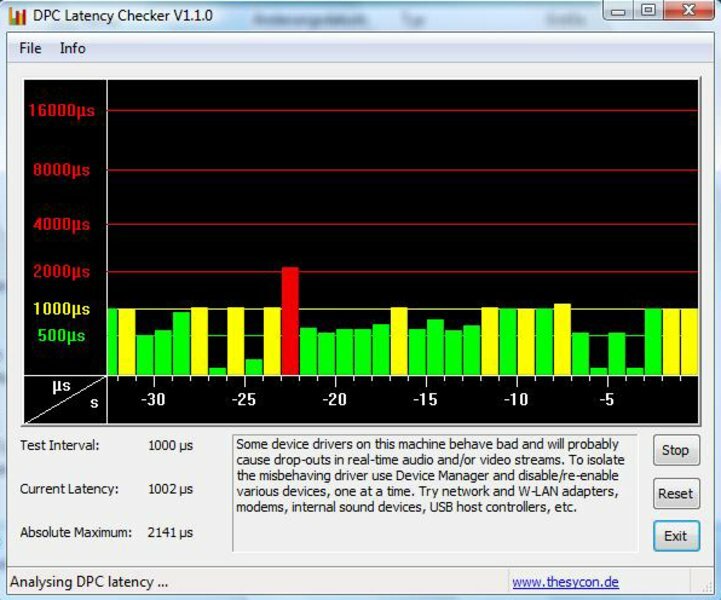 We've checked the system for possible latencies, which might lead to synchronization errors when using external devices, with the DPC Latency Checker tool. The critical point of 2000 µs is very evidently surpassed in one case, and could therefore lead to erroneous results. The usual suspects, like WLAN and Ethernet, improved the overall results in a deactivated state, but the true felon with over 2000 µs couldn't be pinpointed. You probably won't get by making a more circumferential error detection via expulsion procedure. 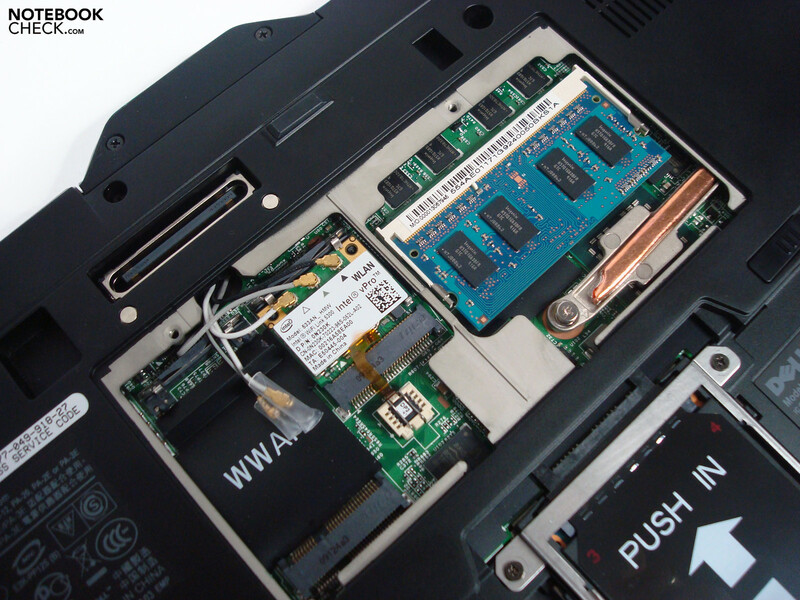 Our prototype is still equipped with a 64GB SSD from Samsung, which isn't available in the online store anymore. There, you can choose between a common 80GB hard disk and two SSDs with a capacity of 128 GB or 256 GB at the moment. 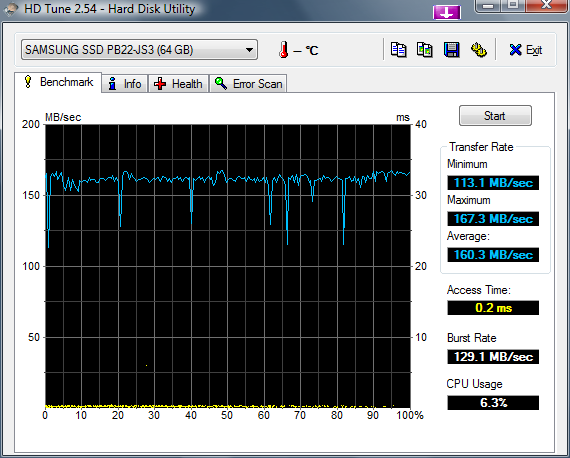 Our SSD reached an average transfer rate of 160 MB/s in the HD Tune benchmark. This is a very good value and is impressive especially with an access rate of 0.2 ms, in comparison to common magnet plates in notebooks. The transfer rates collapse to 17 (read) and 5.5 MB/s (write) as soon as coincidental write / read access of small data sizes (4K Test CrystalDiskMark 2.2) is demanded. This barely affects the subjective sense of speed at normal practical use. The noise development can be called very modest in many application fields. If the convertible is put under little or no demand (writing text documents/internet surfing) it's even silent. This is due to the scarcely running fan, for one thing and for another, because of the silent SSD that successfully cuts the usual hard disk clattering. The fan is audible at medium load with 32.7 dB(A) but remains inconspicuously in the background due to the sonorous fan noise and is barely perceptible. First when the system is brought to its performance limits, does the cooling system have a difficult time of discharging the waste heat of 26.8 watts power consumption out of the case and reaches 37.2 dB(A) on its maximum level. Dell doesn't trade low noise emissions for higher case temperatures due to a throttled fan occupation. We measured temperatures of a maximum of 41.1°C on the bottom even under continuous full load (1 hour). The temperatures are much lower in the keyboard and wrist rest working area and are absolutely within a green field with less than 30°C. The values are even overall reduced by 1 to 3°C at lower demand (2 hours permanent use with max. energy saving settings). Merely the right half of the wrist rest gets a bit warmer with 32.1°C. (+) The maximum temperature on the upper side is 36.9 °C / 98 F, compared to the average of 35.4 °C / 96 F, ranging from 21.8 to 55.7 °C for the class Convertible. The lateral loudspeaker output radiates only to one side due to construction and is therefore not able to create a surround soundscape to any extent, for instance at movie rendering. The treble-prone sound characteristic is only feasible for background music in presentations or for distraction during work, anyway. The good maximum volume can barely be used though, as distortions and clattering turns up at a volume level of about 75%, which is clear evidence for a considerable overload of the small speakers. However, headphones or a separate USB loudspeaker quickly provide relief. 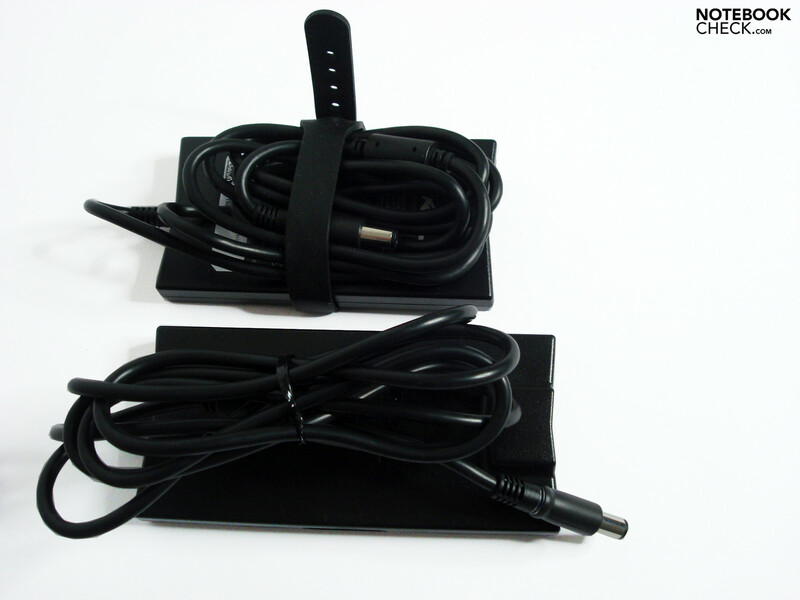 Our prototype is equipped with the standard battery and can fall back on a capacity of 28 Wh of the 4 cell pack. 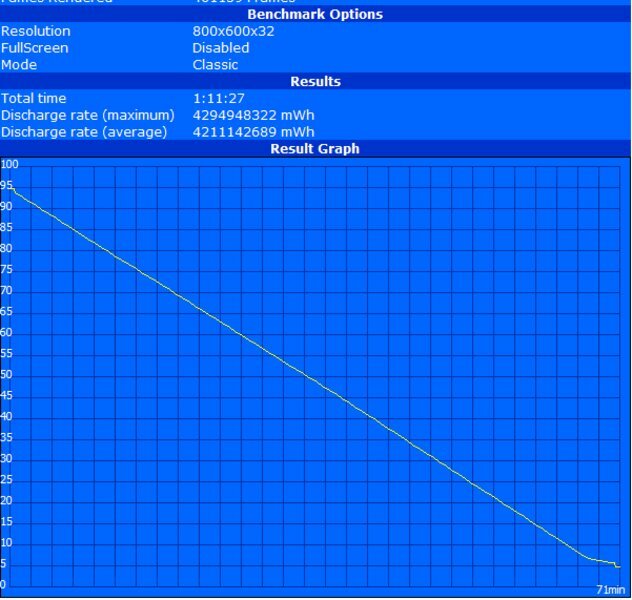 For a surcharge of 20.00 euro net, you can take a 6 cell battery with 42 Wh capacity in the configuration, which only increases the weight by a moderate 100 g. A supplementary 6 cell battery is available for 100.00 euro and a high performance battery with 9 cells and 45Wh (slice battery) costs a steep 240.00 euro net. 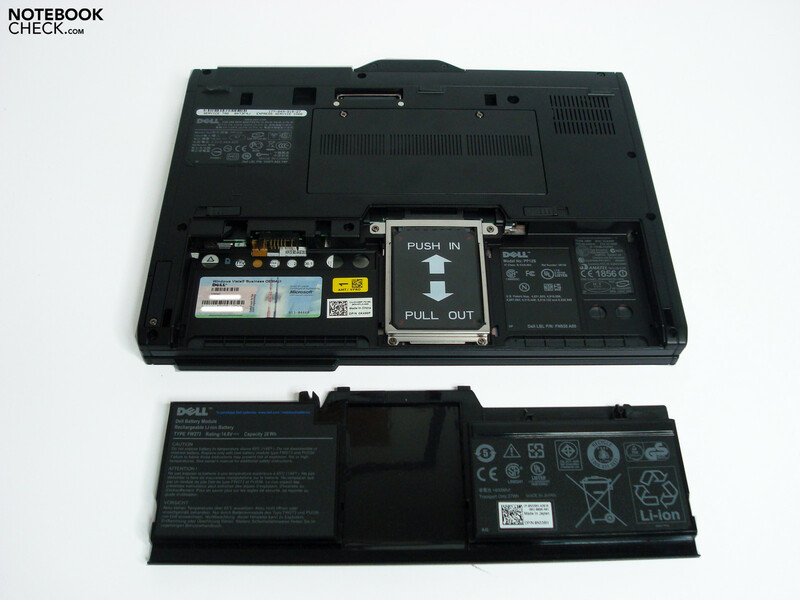 This has a particularly flat construction form and is placed under the notebook (slice battery). A runtime of over 8 hours could be reached together with the bigger primary battery. 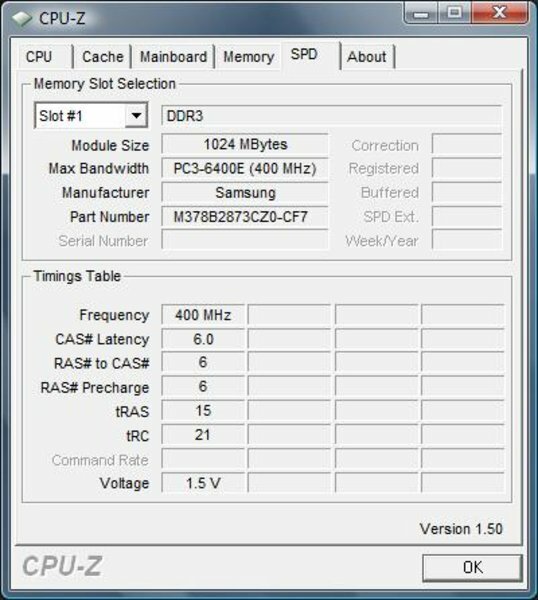 We established a minimum power consumption of 9.5 watts in our measurements. This increases, depending on the energy mode and enabled components, to 11.4 watts or rather 13.7 watts. 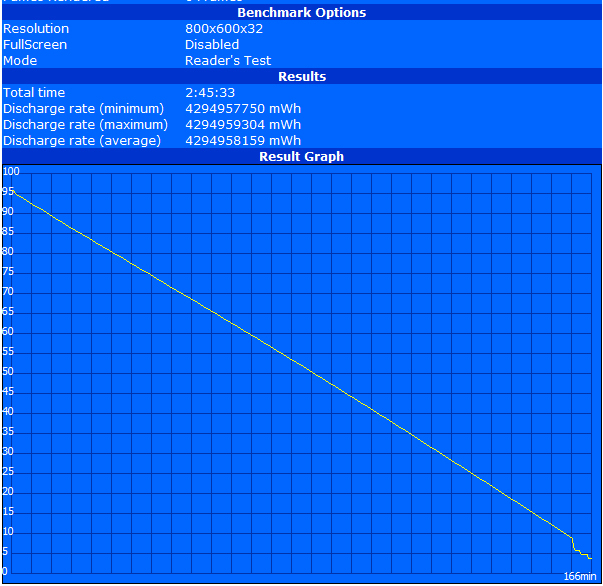 It climbed to 21 watts under medium load with all consumers enabled and to a maximum of 26.8 watts under full load. These are overall moderate values, but sooner lead to modest battery runtimes due to the 28 Wh battery. We achieved 166 min. in the BatteryEater Reader's test (maximum possible runtime). The battery lasted for 149 min. in WLAN surfing and you should have a closer look at the running time of movies (movie files played from the hard disk) because the time of 109 min. could turn out tight sometimes. The system reached a scanty 71 min. under full load in the BatteryEater's Classic test (minimum possible battery life) and finishes work before it's even begun. Thus, a longer, flexible use with the 28 Wh battery of the basic configuration isn't possible and is only enough for fundamental mobile requirements. The Latitude XT2 strikes especially with the convertible construction and the alternative input and application option tied to that. The finger input convinces with a quick managing of basic tasks and above that the pen input is even suitable for more sophisticated tasks like separating objects or sketching freehandedly, due to its high precision. 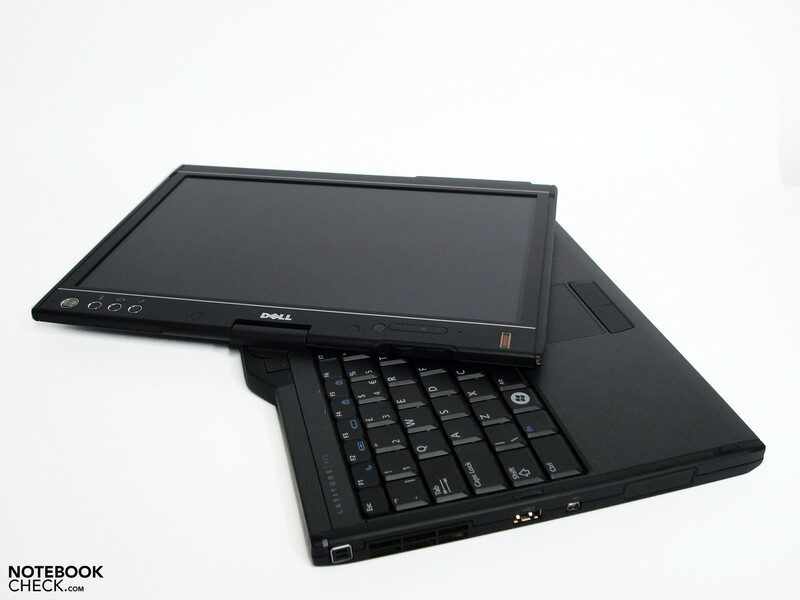 The concept is on the whole well-considered and bids an agreeable operating comfort with the available hot keys on the display edge in tablet mode. The efficiency is more than sufficient for the surmised application fields. The XT2 can be well attuned to the requirements with the many optional accommodation options, but taxes the company's wallet quite a bit. Despite the fairly low weight and the compact dimensions, our prototype isn't very suitable for classic mobile tasks. 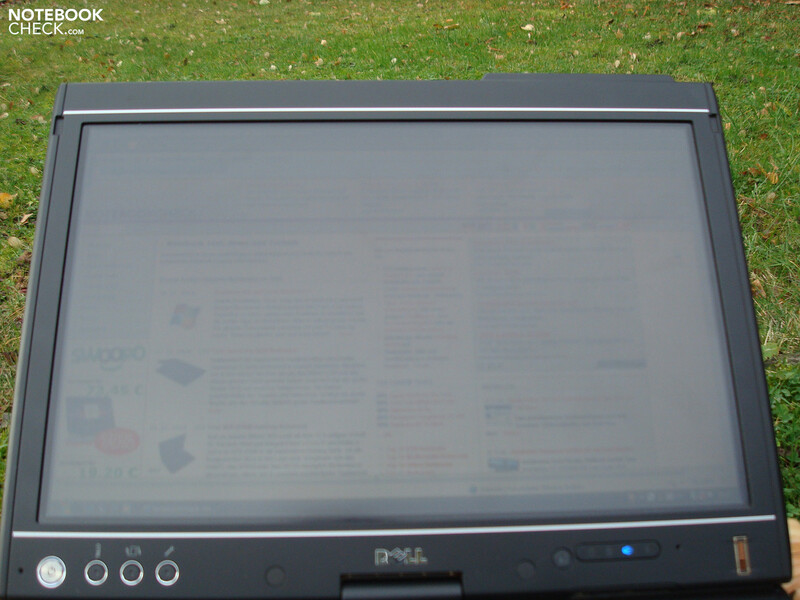 The low in capacity standard battery is only enough for a minimum of demand and the half-reflective display has a too weak backlight for outdoor use. Also, not everyone will like the somewhat instable hinge construction and the yielding display frame. Somewhat inconceivable is the complete omission of a webcam, whereby it's almost unimaginable without them these days. ...but additionally uses the convertible construction advantages. ...or as a tablet PC. The typical buisness gray is representative for client-suitable modesty. 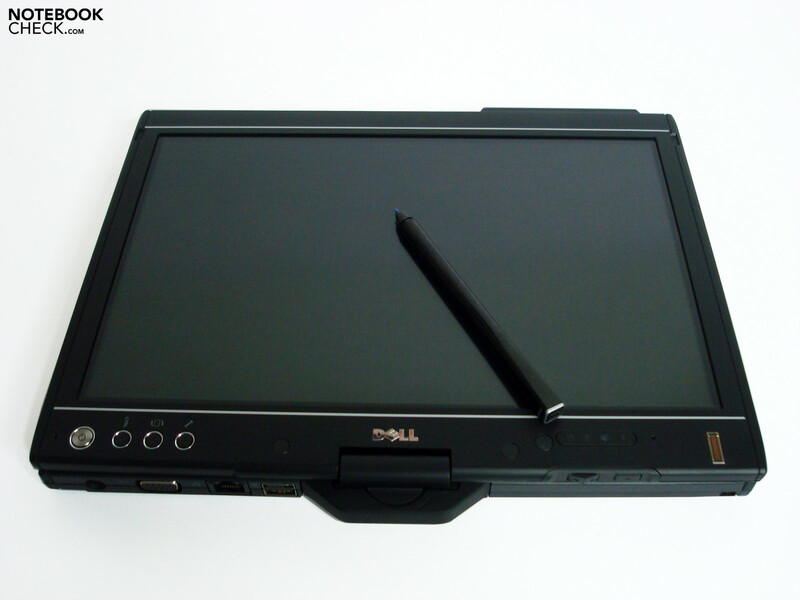 The display can be used with the pen or directly with the fingers. A standard battery with a larger capacity.